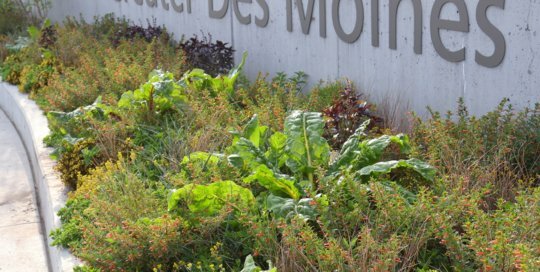 The parking lot and entry garden welcomes visitors with a naturalistic planting inspired by the riparian context of the Botanical Garden site. 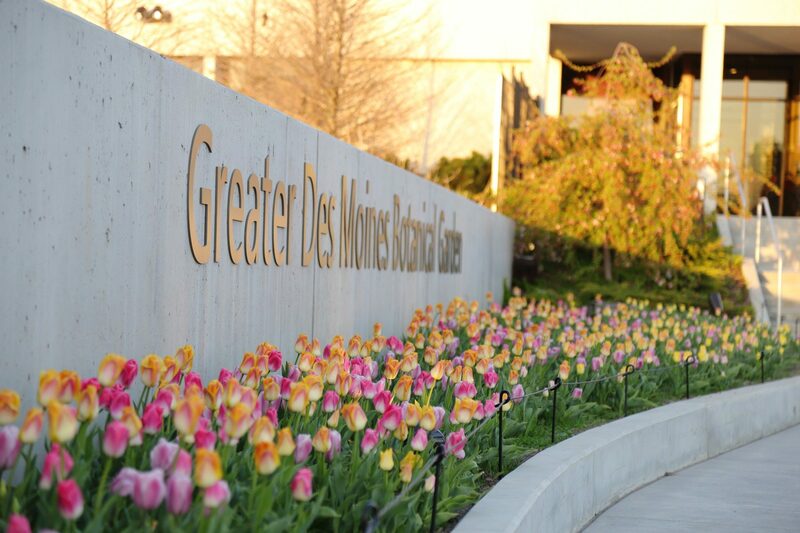 In spring, sweeps of 30,000 bulbs wash the Garden’s entrance in yellows (Narcissus) and blues (Muscari). 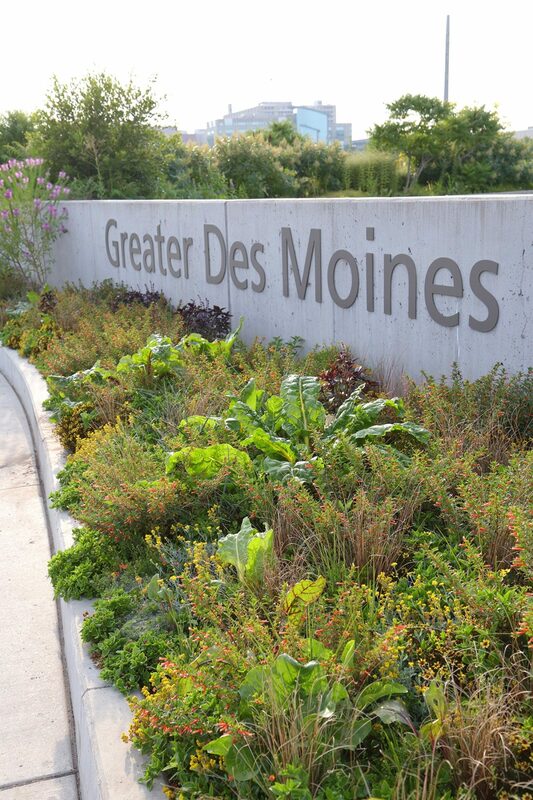 In summer, broad drifts of Iowa native grasses punctuated with colonies of shrubs, trees and colorful masses of perennials serve as a relief from the city’s hardscape and an abundant reserve for native pollinators, including bumblebees, Monarch butterflies and other Lepidoptera. 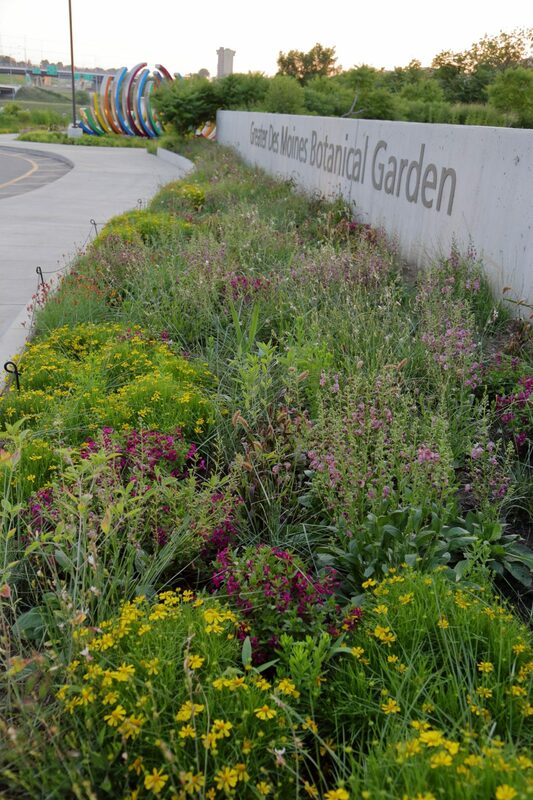 The entry garden, featuring a prominent island planting of Liquidambar styraciflua ‘Slender Silhouette’ (Slender Silhouette sweetgum) and arborvitaes is surrounded by rich and ebullient seasonal plantings that welcome visitors with the gusto of the Botanical Garden mission. 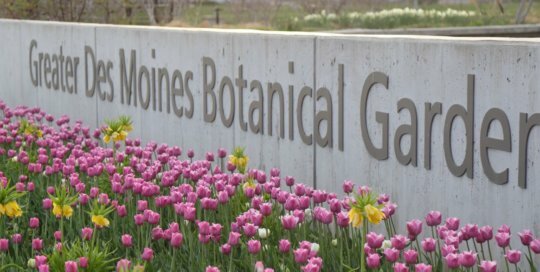 The sign wall across the drive serves both the vehicular and pedestrian arrival experience with mass tulip displays in spring and eclectic annual schemes in summer and fall. 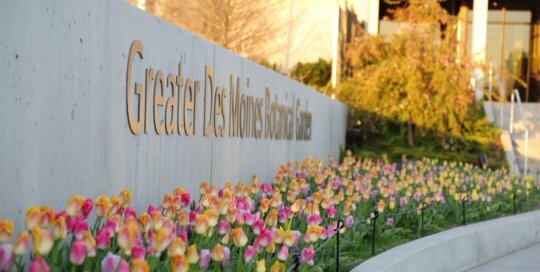 The entry garden is made possible through the generosity of EMC Insurance Foundation. 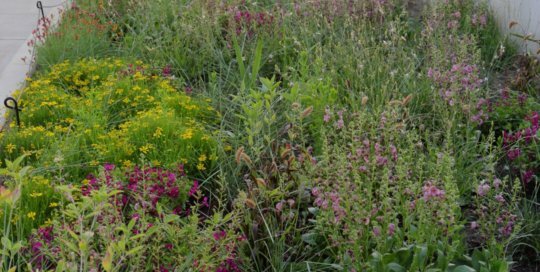 The meadow planting in the EMC Insurance Foundation Entry Garden on August 2. Photo by Kelly Norris. 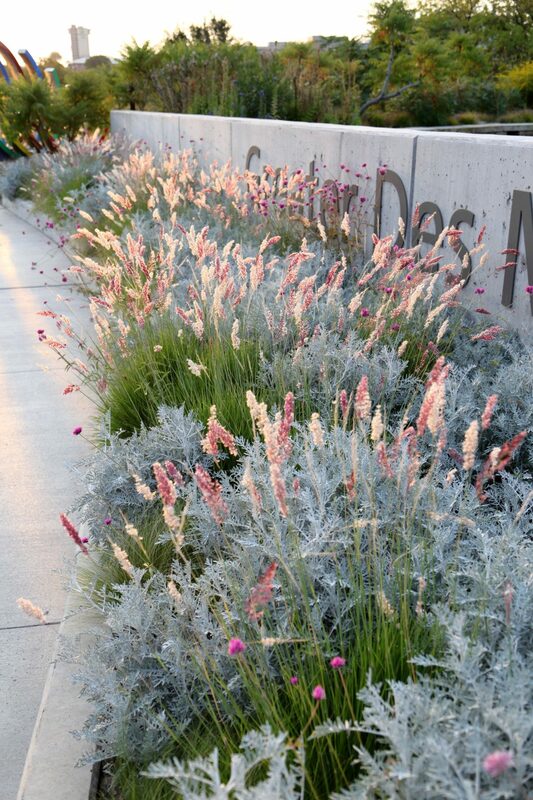 Melinis nerviglumis 'Savannah' (Savannah ruby melic grass) glimmering in the entry garden. 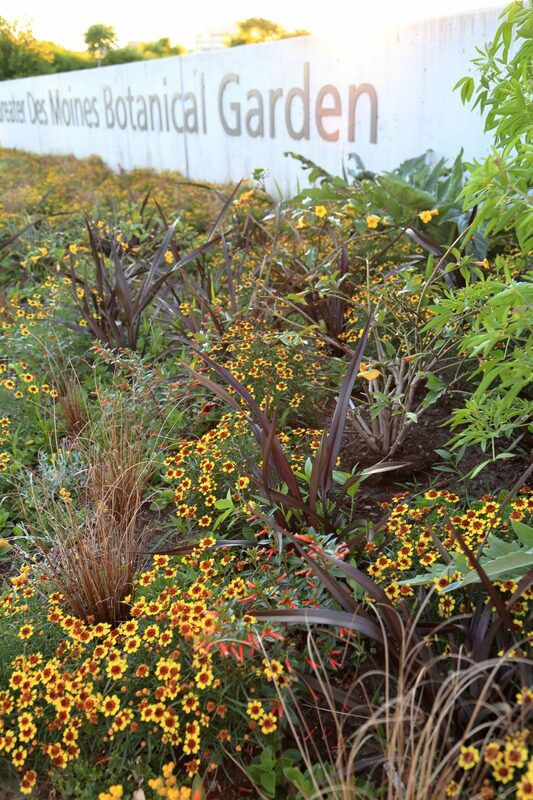 Juicy colors pop from the EMC Foundation Entry Garden. Photo by Kelly Norris. 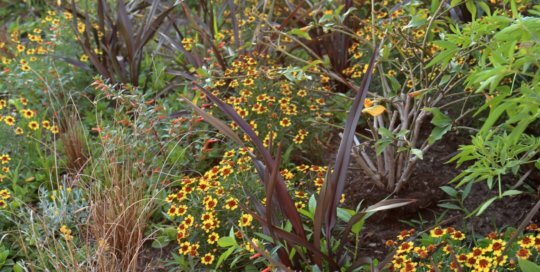 A summer matrix of coreopsis, sedges, cupheas and more in the EMC Insurance Foundation Entry Garden, June 18. Photo by Kelly Norris. 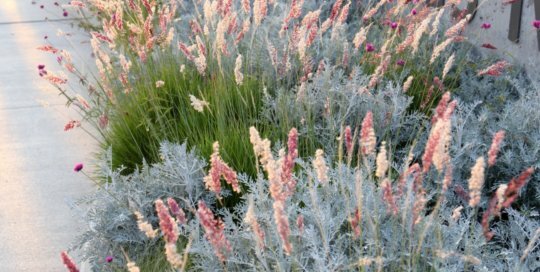 The sign wall in the entry garden with hundreds of Gomphrena 'Fireworks' (Fireworks globe amaranth) exploding over grasses and Centaurea gymnocarpa 'Colchester White' (Colchester White dusty miller).